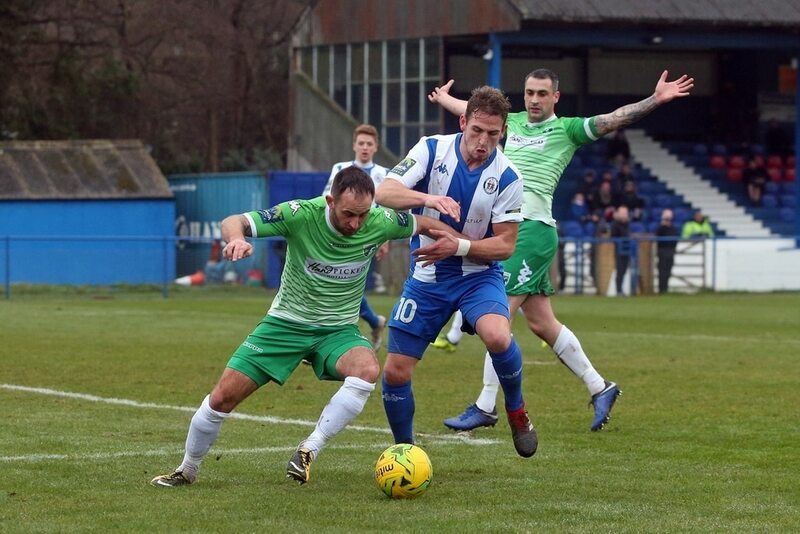 TOM DE LA MARE returns to the Guernsey FC squad tonight but he has got a new rival for the right-back spot, one who few could imagine would play in the ‘2’ shirt the last time GFC had a home match, a remarkable 46 days ago. His name is Dave Rihoy, for years one of the most skilful forwards in the Channel Islands but now into his twilight years as a top player. Vance started him again at right-back at Hastings United last weekend before a tactical switch saw him move into central midfield. But the GFC boss has no qualms about Rihoy playing there. ‘Dave’s one of those who can play anywhere. He is football intelligent, he’s got pace and he’s got a good leap. He has got all the attributes. Vance names a full strength 16-man squad with Charlton Gauvain and de la Mare returning to the group that went to Hastings. ‘It gives us more options with those two players coming back,’ said Vance, who wants to avenge the home defeat by East Grinstead last season and the one suffered at their ground back in September. East Grinstead Town arrive sitting one spot below GFC in the table, but they have also proved hard to beat lately. Wasps’ manager Matt Longhurst last week made two signings and he was particularly pleased to wrap up the signature of midfielder Lee Prescott from Hornchurch in the Bostick Premier League. Comfortable 3-0 winners over GFC back in September, the Wasps have been going well with only one defeat in the last six and that was against the team many consider the champions elect, Cray Wanderers. Four of those games have been draws. The Wasps also last week added forward Jerson Dos Santos, who returned to the club from Carlshalton on a season-long loan. When the two sides met in Sussex earlier this campaign the Green Lions paid dearly for not taking their chances when on top. ‘First half, we were very strong,’ the GFC coach said at the time. GFC squad: Cal Stanton, Keanu Marsh, Jamie Dodd (capt), Frank Tobin, Thomas Dodds, Glyn Dyer, Liam Mahon, Dave Rihoy, Carlos Canha, Paris Pereira, Seb Skillen, Matt Loaring, Will Fazakerley, Kyle Smith, Tom de la Mare and Charlton Gauvain.